Meet my new favorite weeknight dinner! 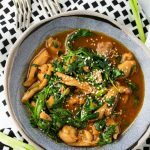 This Korean Chicken Stew with Gochujang Sauce comes together easily, all in one pot, with only 15 minutes of prep. 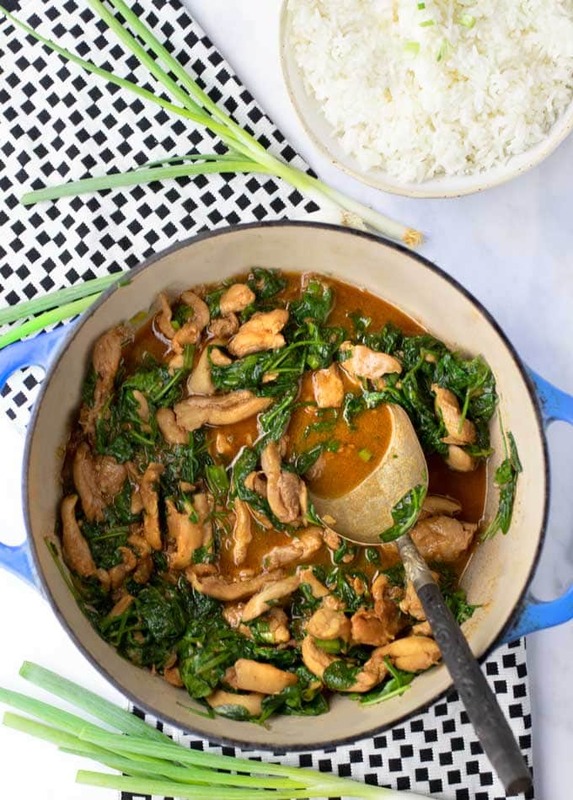 Boneless chicken thighs and spinach in a savory, sweet, spicy, garlicky chili sauce that’s to die for! When you see how easy this amazing sauce is, you’ll want to cook everything with it! 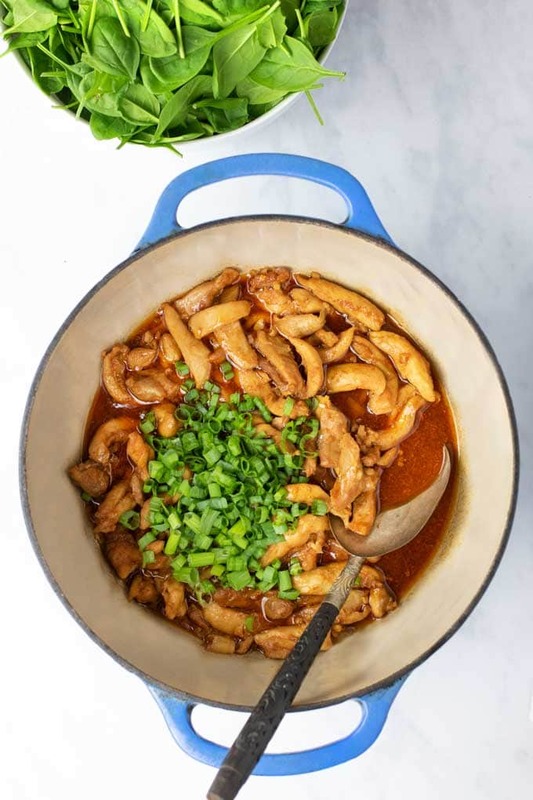 The star ingredient of this Korean chicken stew is Gochujang, Korea’s favorite chili sauce and essential cooking ingredient. Gochujang is made from fermented soybeans and chilies. It has a wonderful range of sweet, spicy and umami flavors. The sauce for this Korean chicken stew has Gochujang plus sesame oil, soy sauce, garlic, ginger and brown sugar, and I have become totally enamored with it. I’ve been making this Korean chicken stew once a week and then trying out a variety of different recipes using this sauce. Last night I marinated salmon in it – amazing! I’m very excited for you to try this dish. If you’re like me, every one of your tastebuds will be applauding! This recipe is minimally adapted from a recipe in Cooking Light Magazine. Cooking Light is one of my long-time favorite recipe sources for delicious healthy recipes. 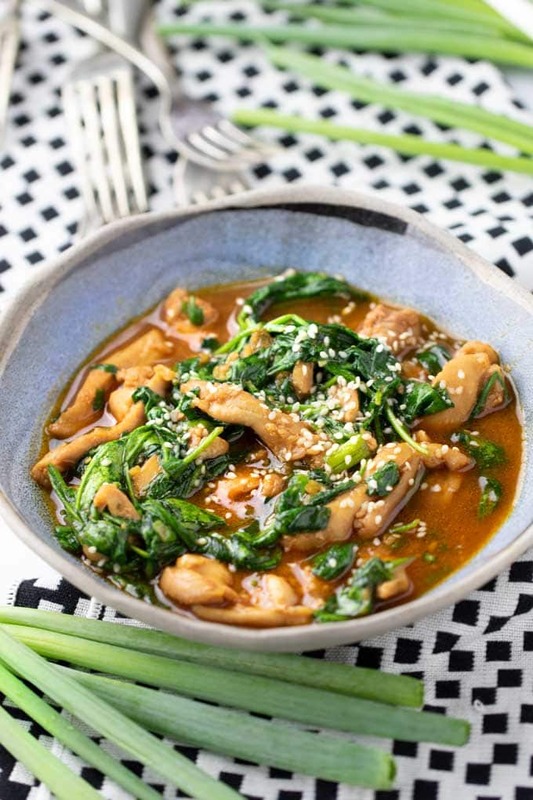 The main ingredients of this stew are boneless chicken thighs sliced into bite-sized strips, lots of fresh baby spinach, and green onions. The 6-ingredient sauce consists of Gochujang, which you’ll find at Asian markets or online, soy sauce, sesame oil, garlic, ginger and brown sugar. Put the chicken and green onion bottoms in a big bowl, add sauce ingredients, toss to combine and leave to marinate for 30 minutes. 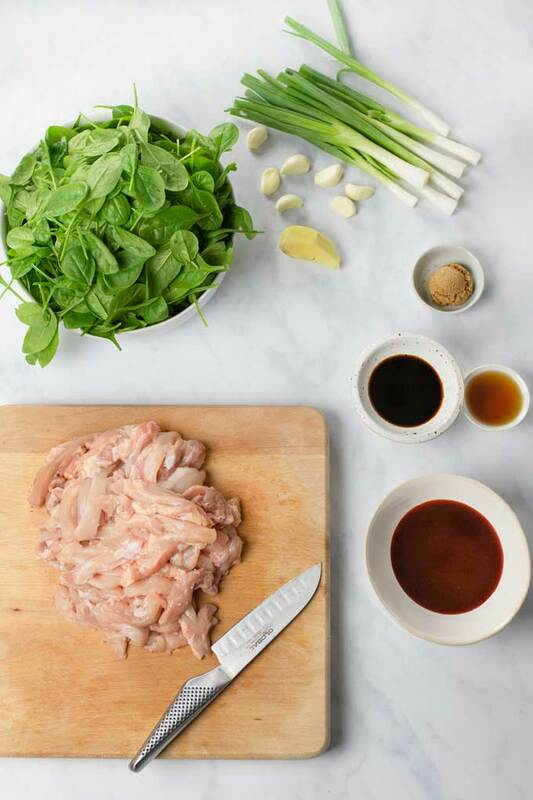 To cook the Korean chicken stew, bring 1/3 cup of water to a boil in a heavy pot. Add the chicken and marinade ingredients and simmer for 30 minutes. That’s it, done! I love that there’s only one pot needed here and no messy or oily sautéing. So easy! After the stew cooks for 30 minutes, throw in the sliced green onion tops and fresh baby spinach leaves and stir until the spinach is wilted. Don’t be alarmed if when you add the spinach to the pot it comes up to the top or even higher. Raw spinach is mostly water and it’s about ten times more voluminous when raw than when cooked. As soon as the spinach makes contact with heat it will start to deflate. Just keep stirring and tossing the spinach into the hot stew and within a minute or two it will be perfectly incorporated. This Korean chicken stew calls out for rice to soak up all the delicious sauce. I’ve served it with white rice because it’s more popular in my house than brown. But I think brown rice would be delicious too and you’ll get the added nutritional benefits of a whole grain. While your stew is simmering and filling the air with its incredible aroma, you’ll have just enough time to set the table and make a pot of rice. This Korean chicken stew is best enjoyed hot. I like to serve it in shallow bowls, sprinkled with toasted sesame seeds and a big self-serve bowl of rice on the side. Whenever you’re in the mood to cook a delicious Korean dish, pay a visit to the ever-expanding Panning The Globe Korean Recipe Archive. 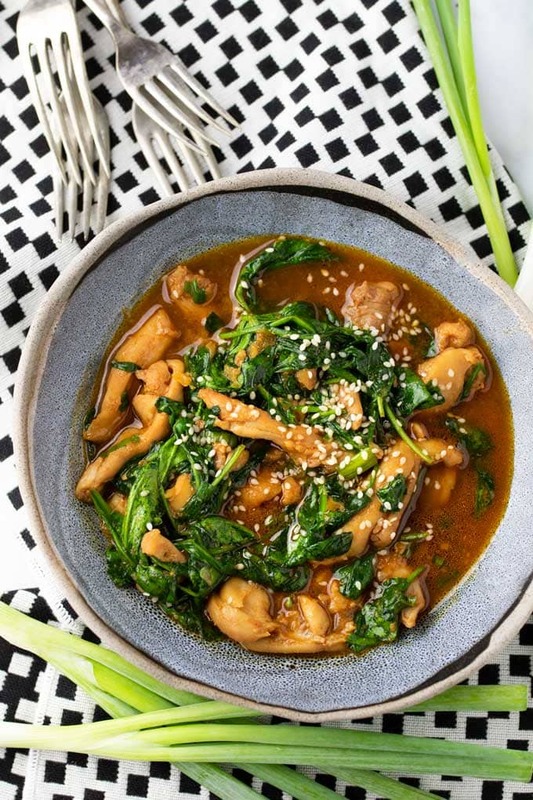 Here’s the recipe for Korean Chicken Stew with Gochujang Sauce. If you try this recipe I hope you’ll come back to leave a rating and a comment. I’d love to know what you think. 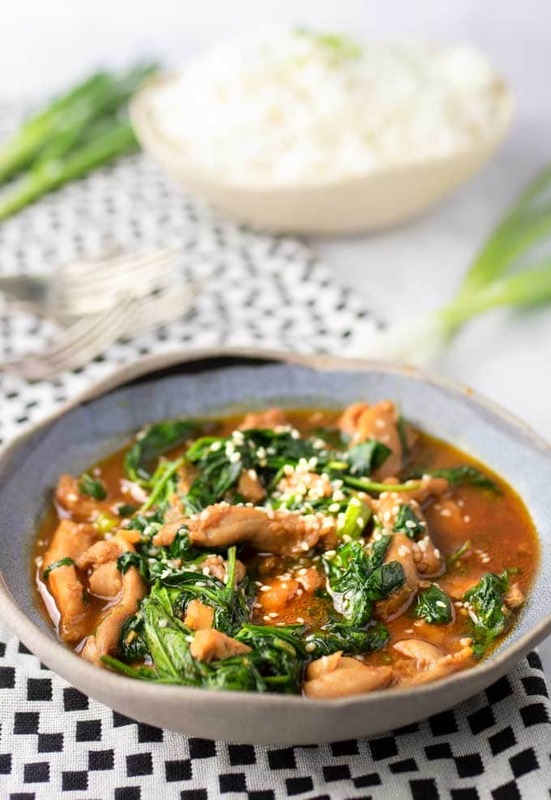 An easy recipe for Korean chicken stew with spinach in a delicious sweet and spicy chili sauce. A delicious one pot dinner that’s perfect for the whole family. 1 large bunch of green onions, cut in half crosswise so the bottoms (white and light green part) are separate from the dark green tops. Cut the bottoms into 1/2-inch pieces. Slice the tops thinly. 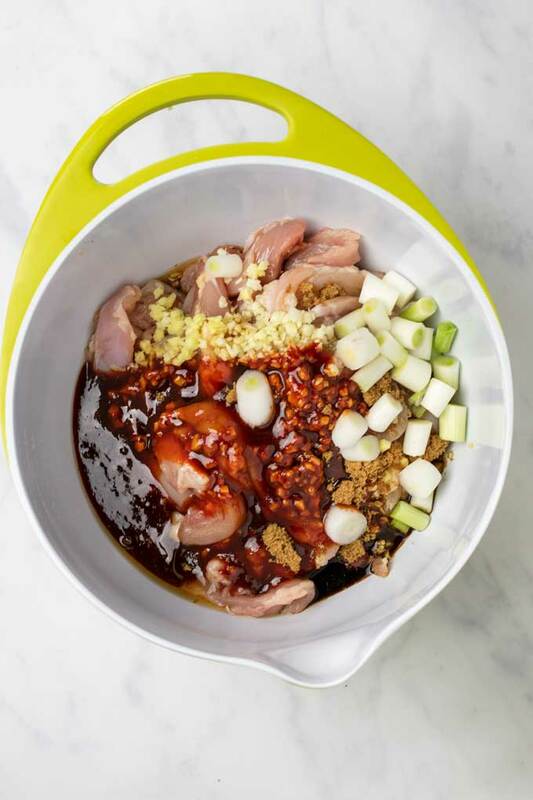 Put the chicken, green onion bottoms and all the marinade ingredients: Gochujang, soy sauce, sesame oil, ginger, garlic and brown sugar, into a bowl and stir to combine. Cover and marinate for 30 minutes. Heat 1/3 cup water over high heat in a Dutch oven or a heavy pot with a lid. As soon as the water boils, add the chicken and all the marinade ingredients. Bring to a boil. Lower the heat to a simmer. Cover and cook for 20 minutes. Give the stew a stir and cook, uncovered, for 10 minutes more, to thicken the sauce. While the stew is simmering, get your rice cooking. Remove stew from heat and immediately add green onion tops and spinach to the pot. Stir and toss until the spinach has wilted from the heat of the stew. Divide the stew among shallow bowls. Sprinkle with sesame seeds. Serve with rice. Nutrition information for this recipe is calculated for the stew only and doesn’t include the rice. Nutrition information is calculated by Nutrifox, an online nutrition calculator for websites. We strive to keep the information as accurate as possible but nutrition information can vary based on many factors. If your health and well being is in question we recommend you check with a licensed dietitian or nutritionist. I’ve made this twice – so delicious! Actually used half chicken thighs and half breast meat. Made this a couple weeks ago for the first time and the family has been asking for it ever since. Simple and a crowd pleaser. I made it for the whole family tonight, Plates were left clean and everyone thought it was absolutely delicious! We are British Indian and l love cooking Chinese/Thai influenced foods. It is the first time I have made Korean style at home and I used Gochujang paste instead of sauce, I suspect it is more potent (but we like our food spicy so it worked for us). Highly recommend this recipe! Look forward to exploring your blog and getting more inspiration. Planning to try a fish marinade as suggested with the left over paste next week. Thanks for your comment Donna. I’m very happy that you enjoyed the chicken. And what a great idea to marinate the chicken in the pot! Why didn’t I think of that!? Another amazingly simple, yet delicious recipe- wine winner chicken dinner!